"Societas Eruditorum" redirects here. For the first learned society in the lands under control of Austrian Habsburgs, see Societas eruditorum incognitorum in terris Austriacis. The Baroque Cycle is a series of novels by American writer Neal Stephenson. It was published in three volumes containing eight books in 2003 and 2004. The story follows the adventures of a sizable cast of characters living amidst some of the central events of the late 17th and early 18th centuries in Europe, Africa, Asia, and Central America. Despite featuring a literary treatment consistent with historical fiction, Stephenson has characterized the work as science fiction, because of the presence of some anomalous occurrences and the work's particular emphasis on themes relating to science and technology. The sciences of cryptology and numismatics feature heavily in the series, as they do in some of Stephenson's other works. The Baroque Cycle consists of several novels "lumped together into three volumes because it is more convenient from a publishing standpoint"; Stephenson felt calling the works a trilogy would be "bogus". The books travel throughout early modern Europe between the Restoration of the Stuart Monarchy and the beginning of the 18th century. Though most of the focus is in Europe, the adventures of one character, Jack Shaftoe, do take him throughout the world, and the fledgling British colonies in North America are important to another (Daniel Waterhouse). Quicksilver takes place mainly in the years between the Restoration of the Stuart monarchy in England (1660) and the Glorious Revolution of 1688. The Confusion follows Quicksilver without temporal interruption, but ranges geographically from Europe and the Mediterranean through India to the Philippines, Japan, and Mexico. The System of the World takes place principally in London in 1714, about ten years after the events of The Confusion. A central theme in the series is Europe's transformation away from feudal rule and control toward the rational, scientific, and more merit-based systems of government, finance, and social development that define what is now considered "western" and "modern". Characters include sir Isaac Newton, Gottfried Leibniz, Nicolas Fatio de Duillier, William of Orange, Louis XIV of France, Oliver Cromwell, Peter the Great, John Churchill, 1st Duke of Marlborough and many other people of note of that time. The fictional characters of Eliza, Jack and Daniel collectively cause real historic effects. The books feature considerable sections concerning alchemy. The principal alchemist of the tale is the mysterious Enoch Root, who, along with the descendants of several characters in this series, is also featured in the Stephenson novel Cryptonomicon. Stephenson was inspired to write The Baroque Cycle when, while working on Cryptonomicon, he encountered a statement by George Dyson in "Darwin among the Machines" that suggests Leibniz was "arguably the founder of symbolic logic and he worked with computing machines". He also had heard considerable discussion of the Leibniz–Newton calculus controversy and Newton's work at the treasury during the last 30 years of his life, and in particular the case against Leibniz as summed up in the Commercium Epistolicum of 1712 was a huge inspiration which went on to inform the project. He found "this information striking when [he] was already working on a book about money and a book about computers". Further research into the period excited Stephenson and he embarked on writing the historical piece that became The Baroque Cycle. Henri Arlanc, Huguenot, friend of Jack Shaftoe. Queen Kottakkal, sovereign of the Malabar pirates. Robert Wiersem of The Toronto Star called The Baroque Cycle a "sublime, immersive, brain-throttlingly complex marvel of a novel that will keep scholars and critics occupied for the next 100 years". ^ Godwin, Mike; Neal Stephenson (February 2005). 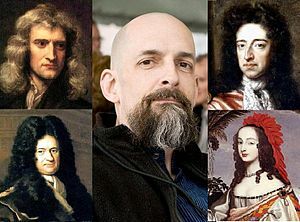 "Neal Stephenson's Past, Present, and Future". Reason. Retrieved 2007-08-11. Labels such as science fiction are most useful when employed for marketing purposes, i.e., to help readers find books that they are likely to enjoy reading. With that in mind, I'd say that people who know and love science fiction will recognize these books as coming out of that tradition. So the science fiction label is useful for them as a marketing term. However, non-S.F. readers are also reading and enjoying these books, and I seem to have a new crop of readers who aren't even aware that I am known as an S.F. writer. So it would be an error to be too strict or literal-minded about application of the science fiction label. ^ "2004 Award Winners & Nominees". Worlds Without End. Retrieved 2009-07-21. ^ "2005 Award Winners & Nominees". Worlds Without End. Retrieved 2009-07-21. ^ a b c d Stephenson, Neal. "How the Baroque Cycle Began" in P.S. of Quicksilver Perennial ed. 2004. ^ "The Power of Three". The Toronto Star. 2004-10-03. Retrieved 2010-04-01.